Performance There are 17 products. There are many reasons why a horse may be lethargic, lack performance or quickly tire so we have to look at exactly what the horse is expected to do and see what we can do to help. Obviously, we have to make quite sure that the horse is fit and well. Good schooling and training should be taking place to build up muscle and stamina. Then we can start to look at what we can do for it nutritionally. If the horse is going to be doing some very strenuous exercise, then we have to provide the fuel for it to do so. There is no substitute for good nutrition and there are many products on the market that claim to provide the answer. In fact, for the average horse owner, making the right decision on what to buy must be mind blowing! So let us try and keep the job simple. A horse is a simple, single stomached, fibre eating animal. This means that first and foremost we should be providing the best quality fibre we can afford, and then we should be topping it up with important minerals, vitamins and trace elements. We should always try to keep the hard feed to a minimum to avoid digestive upsets. Remember oil, (that means any oil) is two and half times higher in calorific value than cereals and horses can digest oil quite easily. It will supply a lot of energy, particularly something like our Glow & Shine Omega Oil. Our Diamond Omega supplement is micronised ground linseed, containing a lot of oil in both Omega 3 and Omega 6 form and is a wonderful product to feed through the summer months as a good source of energy. It also provides essential vitamins and minerals for good health. We also have a choice of oils from Cod Liver Oil, Soya Oil and Linseed Oil. 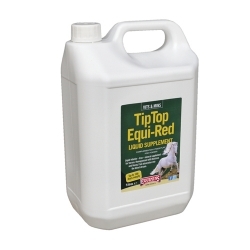 Tip Top Equi-Red is a liquid iron based supplement supplying all important vitamins and minerals in a honey and a dextrose base for rapid absorption into the bloodstream. Advance Concentrate Complete and Pro-Bio are two more supplements that provide a superb array of nutrients to keep your horse looking great, and provide the correct nutrition to help energise your horse. There are other specialist products we provide for releasing extra energy, namely DMG, (Dimethyl Glycine), otherwise known as Vitamin B15 or Pangamic acid. It helps to increase oxygen uptake and therefore quicker recovery from strenuous exercise and is an excellent energy booster. Creatine Monohydrate is a natural amino acid that helps to build lean muscle and provide more energy. It is also a useful buffer against the build-up of Lactic acid. For the traveller going to events, we have Energy B Booster in an oral syringe to administer two hours before competing. None of these products have any contra indications for competing so are quite safe to use. 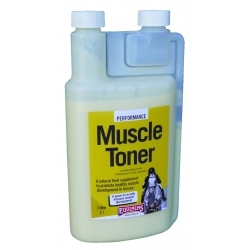 Muscle Toner is a fantastic product to quickly build muscle on a horse that has perhaps been neglected or just looking poor. It will quickly help build good solid muscle to help provide more stamina. L-Carnitine is a naturally occurring nutrient found in animals and plants. Horses gain L-Carnitine through the synthesis of amino acids. However they cannot quickly replace the extensive loss of L-Carnitine that occurs after strenuous exercise. L-Carnitine increases the ability of the muscles to utilise fatty acids, resulting in increased energy supplies. It is available in 250ml & 1 litre bottles with larger sizes available on request. For travelling horses, there is also L-Carnitine Oral Paste Syringe, available in a 30ml syringe for a quicker fix just before competing. A natural feed supplement to promote healthy muscle development in horses. 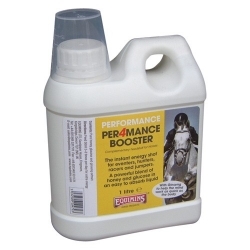 The instant energy shot for eventers, hunters, racers and jumpers. A balanced formulation of essential body salts and minerals. 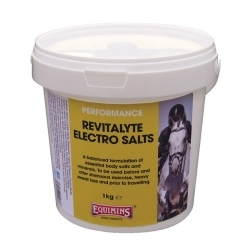 Helps replace and maintain important electrolyte salts. Liquid Vitamin – Iron – Mineral supplement for horses. 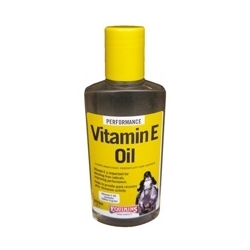 This oil is an excellent way to provide Vitamin E in its most natural form.